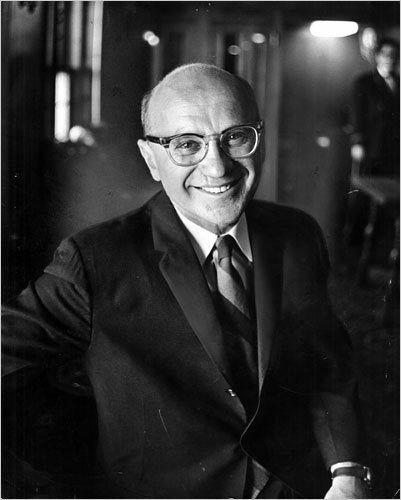 Milton Friedman was an American economist, statistician, and a recipient of the Nobel Memorial Prize in Economics. He is best known among scholars for his theoretical and empirical research, especially consumption analysis, monetary history and theory, and for his demonstration of the complexity of stabilization policy. He was an economic advisor to U.S. President Ronald Reagan. Over time, many governments practiced his restatement of a political philosophy that extolled the virtues of a free market economic system with little intervention by government. As a professor of the Chicago School of Economics, based at the University of Chicago, he had great influence in determining the research agenda of the entire profession. Friedman's many monographs, books, scholarly articles, papers, magazine columns, television programs, videos and lectures cover a broad range of topics of microeconomics, macroeconomics, economic history, and public policy issues. The Economist magazine praised him as "the most influential economist of the second half of the 20th century�possibly of all of it."